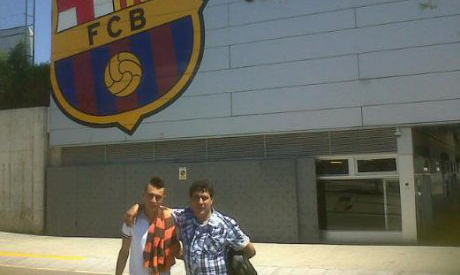 Spanish and European champions Barcelona have acquired the services of the 15-year-old Moroccan forward Mounir El-Haddadi. “I had trials at Atletico Madrid and last season I played for Rayo Majadahonda (fourth division) before joining Barcelona last week,” El-Haddadi was quoted as saying during an interview published on Moroccan website Mountakhab. The young starlet – who will turn 16 on September 1 – scored 32 goals in 29 games for Rayo Majadahonda, attracting the eyes of the Barca scouts. “My agent was approached by Manchester City, Getafe, Osasuna and Rayo Vallecano also, but Barcelona was our first choice. I just want to focus on my play and prove I am worth it,” said the hot prospect, who sees Moroccan forward Adel Taarabt and Argentinean prodigy Lionel Messi as his idols. Talking about his international career, El Haddadi committed his future to the Atlas Lions despite being ignored until now. “Spain U-16 officials have already contacted me to join the team. But if I get a call up from Morocco I will surely respond because it is my country of origin,” he concluded.